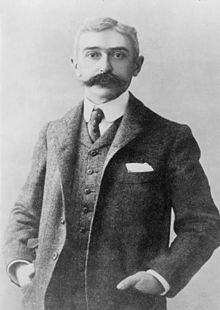 Pierre de Frédy, Baron o Coubertin (French pronunciation: ​[pjɛʁ də kubɛʁtɛ̃]; 1 Januar 1863 – 2 September 1937) wis a French eddicator an historian, an foonder o the Internaitional Olympic Committee. He is considered the faither o the modren Olympic Gemmes. Born intae a French aristocratic faimily, he acame an academic an studied a broad range o topics, maist notably eddication an history. This page wis last eeditit on 25 Julie 2017, at 11:45.